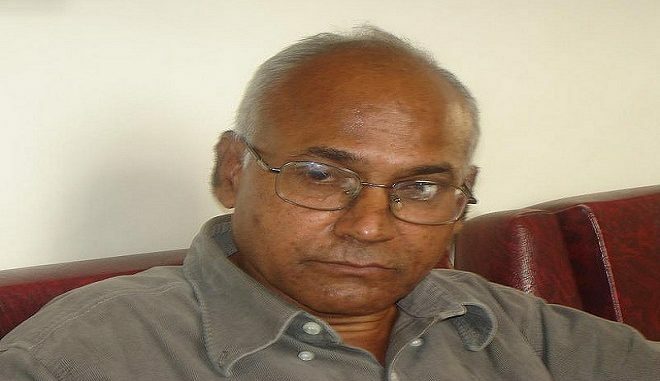 Hyderabad, Sep 11 Eminent Dalit thinker Kancha Ilaiah on Monday sought police protection saying that he is facing threat to his life even as Arya Vysya organisations staged protests in parts of Telangana and Andhra Pradesh seeking ban on his book. The writer lodged a complaint with Osmania University Police Station, stating that he had been receiving threatening phone calls since Sunday. He claimed that he started receiving calls after some leaders of Arya Vysya organisations, while talking to TV channels, condemned him. He sought immediate police protection. Meanwhile, various organisations of Arya Vysya community staged protests in different parts of the two Telugu states demanding action against Ilaiah for insulting the community in his book “Samajika Smugglurlu Komatollu (Vysyas are social smugglers)”. The protestors burnt effigies of the writer and lodged police complaints against him. They demanded immediate ban on the book saying its contents are derogatory and demeaning to their community. Ilaiah, however, said it was not a book but a chapter from his English book “Post Hindu India” published in 2009. He said a publisher got the chapter translated into Telugu and published it as a booklet. Stating that it was a research book on various communities, Ilaiah denied that he used any derogatory word. “Social Smuggling is a phrase. It is the economic process of exploitation, which means earning in business but not investing back into society,” he told reporters. The professor said if anybody had any objection with regard to any contents of the book, he could approach the court. Meanwhile, former Andhra Pradesh Chief Minister K. Rosaiah, who belongs to Vysya community, said it was not proper on part of anybody to hurt the sentiments of any community. The former Tamil Nadu Governor said the writers should avoid using any derogatory terms against any community. In another development, All India Majlis-e-Ittehadul Muslimeen (AIMIM) chief Asaduddin Owaisi demanded protection for Ilaiah and action against those threatening him. Owaisi also voiced concern over increasing attacks on journalists. The Hyderabad MP alleged that those writing against BJP and RSS were facing threats.